This is another chocolcate cake with strawberry mousse filling, and it is for my art teacher, Michael Chen, who's art institute is located in Arcadia, California. I always complement him on how patient he is with the students and parents. I enjoy painting at his studio as he does not "touch up" on my painting; rather, he comes around and critique on what he sees not satisfactory. This teaching method really works for me; it helps me see my blind spots, and it is usually the whole painting! Hahaha... If any of you were interested in learning to paint or draw, just give Michael a call at (626)446-7822 begin_of_the_skype_highlighting (626)446-7822 end_of_the_skype_highlighting. 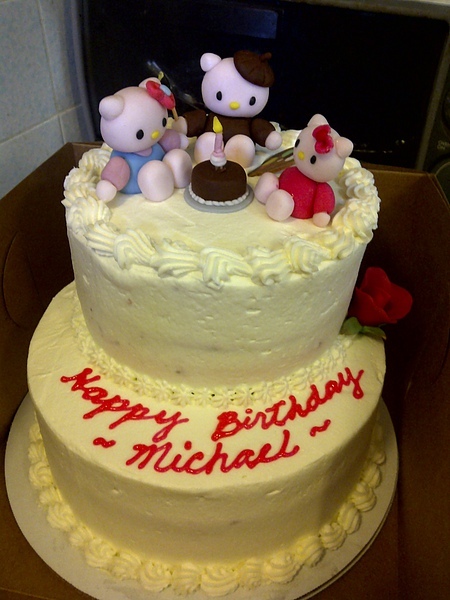 Michael is the loving father of 6 year old Ashley, and since Hello Kitty is Ashley's favorite doll, he asked me to make a Hello Kitty cake. So I made this happy Hello Kitty family to portrait his own. Hope he and his family really enjoyed the cake as well as the decorations. 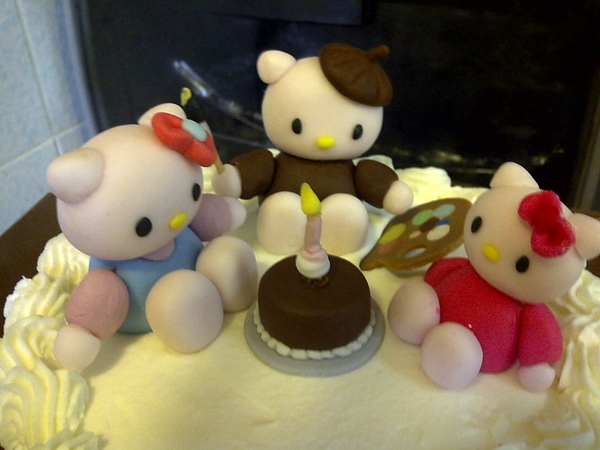 The happy Hello Kitty family with the artist dad adn mom the baker.